Hoor Al Qasimi, President of The Africa Institute, announced on 16 September 2018 the inauguration of the newly rebuilt Africa Hall and the establishment of The Africa Institute. 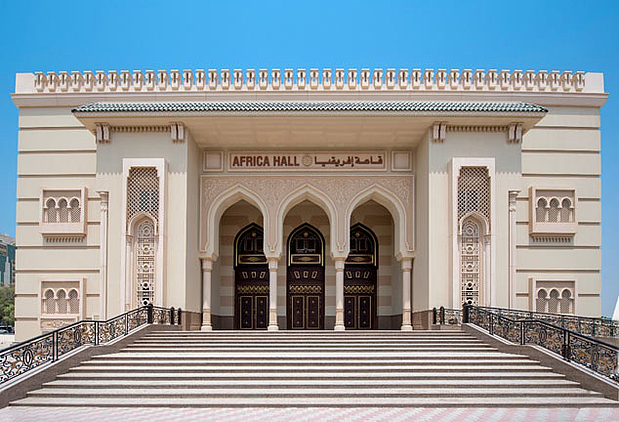 Initially opened in Sharjah in 1976, Africa Hall’s first cultural and political event was the Arab-African Symposium, held 14-18 December 1976. The new Africa Hall, which has been rebuilt on the same site as the original building, will serve as the meeting place for conferences, symposia, lectures, film screenings, stage plays and performances related to the activities of The Africa Institute. An additional building which will later permanently house The Africa Institute will be constructed adjacent to Africa Hall, designed by Sir David Adjaye. The Africa Institute will serve as a globally-oriented, interdisciplinary academic research institute dedicated to the study, research, and documentation of Africa; its people and its cultures; its complex past, present, and future; and its manifold connections with the world. This centre for African and African Diaspora studies will also examine the historical and contemporary linkages between Africa and the Arab Gulf region, demonstrating that geographic proximity and economic and cultural exchanges over millennia have long connected Africa and the Arab Gulf. Conceived as a research-based think-tank and a postgraduate studies institution, The Africa Institute will offer both Masters and Ph.D. programmes. ‘The newly rebuilt Africa Hall is hoped to revive the golden era of the building in the 1970s and 1980s when it served as the hub of cultural events that included literary events, theatrical and musical performances, and poetry reading, in addition to conferences and symposia on ranges of topics,’ said Dr. Salah Hassan, Goldwin Smith Professor and Director, Institute for Comparative Modernities, Cornell University and academic advisor to The Africa Institute. The opening programme for Africa Hall will run from 25 to 30 September and will include performances by Zied Zouari, Youssou N’Dour and The Fathy Salama Orchestra (25 September), Youssou N’Dour and Le Super Étoile de Dakar (26 September), Oumou Sangaré (27 September), Mulatu Astatke (28 September), Lisa Simone, DJ Peter Adjaye (29 September), and Somi (30 September), as well as a screening of the film An Opera of the World (2017), directed by Manthia Diawara (28 September). The symposium 5-plus-1: Rethinking Abstraction, presented by Sharjah Art Foundation (SAF) and held in conjunction of SAF’s exhibition Frank Bowling: Mappa Mundi will also take place in Africa Hall on Sunday, 30 September 2018. The symposium is convened by Okwui Enwezor (curator, critic, and former director of Haus der Kunst), Hoor Al Qasimi and Salah M. Hassan. Die Gruppe ägyptischer Surrealisten und ihre Beziehungen zu internationalen Pendents. 28. Sept. - 28. Nov. 2016, Palace of Arts, Kairo. Kuratiert von Hoor Al Qasimi, Salah M. Hassan, Ehab Ellaban, Nagla Samir. Internationale Konferenz der Sharjah Art Foundation und des Institute for Comparative Modernities, Cornell University. 10. - 12. April 2015, Sharjah Institute of Theatrical Arts.